Many collectors dream of making their first million with baseball cards. The 2013 Topps Baseball Million Dollar Chase is providing such a chance. 2013 Topps Series 1 Baseball and 2013 Topps Series 2 Baseball have code cards similar to the 2012 Topps Baseball Golden Giveaway and 2012 Topps Football Game Time Giveaway. 2013 Topps Baseball Million Dollar Chase code cards unlock players. Each day, collectors use these unlocked players to pick someone they think will get a hit that day. If that player gets a hit, you start a streak. The first person to break the 56-game hitting streak wins the million-dollar grand prize. Additional prizes are also available for other hit-streak milestones. These include thousands of autograph and coin cards. Season leaders qualify for more autographs and memorabilia. 2013 Topps Baseball Million Dollar Chase code cards are inserted approximately 1:6 packs. Register and enter your codes. Initiate a streak by picking a player you think will get a hit that day. If they do get a hit, your streak continues. You may have three open streaks at one time. You can schedule the start of a streak up to five days in advance. The longer the streak, the bigger the prizes you win. However, you only win the prize for the top milestone reached. For example, if your streak ends at 21 games, you receive the 20-game streak prize of a set of coin cards. You do not get the 15-game streak prize of an autograph or anything below that. Be the first to get "hits" in 57 consecutive games and win $1 million. Each prize level has a limited quantity. Prizes go to those who reach it first. 5-Game Streak: Free code. Entered into a daily raffle for autograph cards. Raffles held 179 consecutive days. You are entered into the raffle only on the day you streak ends. Ten cards will be awarded each day. 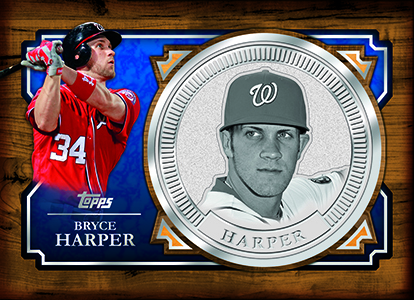 10-Game Streak: Exclusive coin card (Quantity: 2,500). 15-Game Streak: Exclusive autograph card (Quantity: 1,000). 20-Game Streak: Set of coin cards (Quantity: 20). 25-Game Streak: Set of autograph cards (Quantity: 10). 57-Game Streak: $1,000,000 (Quantity: 1). The ten longest streaks at the end of the season get an autographed bat. Codes must be redeemed before October 1, 2013 at 11:59 PM EST. Promotion is open to residents in the US and Canada except Puerto Rico, Alaska, Hawaii and Quebec. That million dollar chase is way harder than it seems. I’m not sure if they still do it, but mlb.com fantasy had the same promotion/task. I remember seeing a couple people go above 40 in a row…my personal record was 19 over a 3 year period. 56 games is going to be tough, but with the chance to win prizes in between, thats pretty tight! Make it easier to enter codes. I hear a lot of comments that its to hard to enter and people throw away there enteries. Do you need a 1million dollar card for each day or do you just use 1…… And do you have to have them all at the same time or can you just go out and get another one like a week later?? The site isn’t live yet, so I can’t say 100% sure – but I’m 99% sure you’ll need a different code for each day. Those codes will also only unlock certain players. The idea behind these programs is to get people to keep buying product (or you can buy the code cards directly from the secondary market). Too funny. We were literally just updating our post when you posted this. Have fun and good luck! lawry arnold � Not sure what you’re trying to register for? The Million Dollar Chase? That’s Topps, not us. Any idea of the direct hit odds from the website (without achieving a streak)? I’ve entered about 100 codes and have only received players for my roster – no cards. Can I use the same player 2 or more games in a row if he gets a hit? Or only the one game? I’m Very concerned about #1 you can ONLY use 9 codes? is this correct? so what do we do with free codes and what about all the extra code cards? #2 what about around the allstar game the first game of the year and the last game of the year there are only 1 or 2 or 3 games played, if we have no players does our streak end?? Please let me know, would be great, thank you!! OK – a couple of things. First, in the Topps Million Dollar Chase, you have to reach 60 consecutive hits (just read it in the “How to Play” on the official website) to win $1 million (not 57, as stated at the top of this page). Second, it will be IMPOSSIBLE to reach that goal with only the 100 players provided to choose from – minus the injured players (i.e., Jeter, Texeira) and the Minor Leaguers (i.e., Profar), AND you’ll need to enter approximately 250 redemption codes to receive the full list of players (again, only 100) to choose from, AND if the player you pick does not get a hit, you lose that player for good (until you enter a code that provides that player to you again)….. If nobody can reach the 57 games required to win the big money (now $5.6 million) on MLB.com out of the millions of people who have played that game over the years with the ability to choose from a bigger pool of major league ballplayers, I do NOT know how someone will do it on Million Dollar Chase. Its season opner day, and I still can’t pick a player to start my streak. Maybe b/c I dont have any Rangers/Astros yet? I only have 9 cards online, so I hope those players do awesome or I’ll have to get more codes! I have two Alex Gordon’s so I might use him first. But I also have Mike Trout, so I might start with him and just hope he hits in every single game of the season, right! Go to My Streaks to select a player. I can no longer add players to streaks. Is their a phone help line? I have four players right now. None of them play on April 11. If I leave that space blank am I done for on my 3 streaks. I registered and have many players on my team. Cannot figure out how to designate a hitter to start a streak. Please help! Thanks! Frank Schaukowitch � When you’re logged in, click on My Streaks. Pick a player by clicking it on the carousel and then add them to Streak 1, 2 or 3. It’s not the easiest of interfaces. They said I won a 5streak autograph and code card but it doesn’t show me the picture of the autograph card I won. They will be mailing out cards in may. Why it doesn’t show you the picture of the card you won? It just have a blank photo and a 95×150 in size. What’s up with this? navolin � Congrats on winning. You would have to ask Topps why there’s no picture. Ryan – Thanks for the help. I’m not 100% sure how I did it this time, but I think it worked. Can you only have three streaks going at one time??? Frank Schaukowitch � I believe so. There’s only the three slots. Codes are valid only for the Promotion and may only be used in accordance with these Official Rules. Any other use/attempted use of Codes is prohibited. Codes have no cash value and cannot be redeemed or exchanged for cash or credit. Any attempt to purchase/sell, trade, transfer, assign or exchange Codes is void. pablo streeter � Although I’m no lawyer, I don’t think they can stop the sale of the cards that have the codes on them. Topps knows people buy and sell code cards. While you’d want to check with Topps themselves, it may be a matter of not wanting people selling their virtual portfolios. I started a streak with Ryan Braun on 5/1. He has a streak in process. However, I did not enter his name on 5/2, 5/3, etc. Did I need to do that or does Topps know his streak is still going??? Frank Schaukowitch � I’m pretty sure they keep going until you pull them. Welcome back to the hobby Dan! Good luck and keep us updated on your progress! How do you know the stats – like “I was the 4th person this year to make it to 25” and “my current streak leads the world.” I’ve hit 10 a couple of times. How do we know there are still coins/autos still available – b/c they’re limited to 2,500 and 1,000 respectively. I don’t want to keep playing if there’s nothing left worth playing for… Lastly, it says on the topps chase site the cards will be available to ship in May. Does that mean they’ll automatically ship them, or you have to pay for them to be shipped like last year? Tommy Lantz � You’d have to check with Topps about availability. I don’t think there is a shipping fee as the cards are a prize. That’s how it has been in the past. The vintage giveaway cards had a fee because they were a giveaway and guaranteed with each code. Yes we can all see the list of the leaderboard, you guys are doing a GREAT job i seem to not be able to get past 7-8 games myself :( Good luck and have fun! Skyeye109 � It’s a digital mock-up Topps produced to give people an idea of what they will look like pending approval. Does any one know when Topps will actually start shipping prizes for the Million Dollar Chase? I have won 5 Prizes. It states that they will start mailing in May. Well its past May. But i have yet to receive any prizes . Has anyone received there prizes yet? Please anybody, Help!!! They said I won two autograph cards and haven’t received nothing yet. Have anybody received anything yet? Do they call u or email you for winnings guranted? navolin � Your best bet would be to call Topps. It’s doubtful they will call you. I’ve heard from other prize winners who have had the items appear on their doorstep. You may also want to check the contest fine print to see if they’re holding off sending out all prizes when the promotion ends rather than bits and pieces at a time. Does anyone have the number to topps? I finally got my picture of autograph cards but they haven’t gave me a piccture of the cal ripkens jr. Coin card. Do anybody know the stats on the shipping out. I have add my cards to the cart and sayn processing. Some of these cards are starting to show up on eBay and not as pre-sells. Has anyone seen a checklist for the cards? Finally received one autographed card boone logan. Don’t know if it came from my wrapper redemption or the cards I won on the million dollar chase giveaway. Should have two of those plus cal riken jr. Coin card. Who have received any auto’s yet? Response to MLB-Mike: It should keep your streak going. Doesn’t matter though, apparantly all the prizes are gone. Now people in California and Utah have had their coins and autographs mailed but so far me in Wyoming and at least one guy in Reno have yet to receive our winnings, even though we both requested mailings on the first available day. among the universe of 1m code cards? Hey Guys Should I calls Topps Cust Svc. about my ? and wait 45-60 mins.? I know it appears the major prizes are gone, but shouldn’t the daily raffle prizes – autographed cards – still be available? They are holding 179 straight raffles, with up to 10 cards per day, so there should still be cards available, if the first drawing happened April 4, right? I hope so, because I still have codes! Wooohoo just won an Autographed Adam Dunn Card from the 5 streak daily raffle and it currently shows the picture of the card, status went from pending to processing after verifing my address and I also received a email verification regarding my prize, so far so good and will be interesting to see when this card arrives at my location in San Diego CA. Will be sure to post a comment once it does regarding time frame. Also I hope Topps wraps all of these redemption issues up soon and there is a couple of ways this can be achieved but would cost Topps more then the negative feedback is currently effecting profits. Sounds like the first issue in need of attention is the customer service not being up to par and as is with most large companies. Regardless of size, products offered or how good/bad PR of a particular company is, there will always be room for improvement and is no simple task when it comes to finding employees trained/experianced in C.S. let alone knowledgable of the products, current promotions, current issues, and so on at any given time or for every phone call, let alone that employee having the authority to offer/promise/deny the “Customer is always right” individual who is already frustrated with you because you finally took them off hold……Topps is still the best! Awesome MLB season! Just wanted to give Daniel Cuthbert, what was it skyeye…, a giant screw-you(just joking great streak) for pushing me into losing my streak at 37 with albert poolhouse(HE’S FAT). Really would have liked to undue that pick right after I entered it. I should have been more patient. Looks like my guinea pig rescue will have to wait until next season, assuming Topps does it again. Would have liked to break 40 at least, but like Cubs fans say “we’ll get em’ next year” We miss You SweetP(the rapping guinea piggy) and you will not be forgotten. Much love to Topps, my fellow collectors and Piggies everywhere! win4sweetP will be back next season and will win the $1M to save as many piggies as a million dollars can!